Since the conventional treatment strategies for many diseases is arduous and time consuming, there has been an obvious need of provision of an innovative therapeutic intervention which is essential to the advancement of medicine and can as well be compatible with the medical ethics. Recent advances in stem cell research have explored many therapeutic avenues and the insight gained by the pilot proof of concept studies promises a plethora of vast benefits. With the wealth of information available it is rather difficult to read through what is often complex and confusing material. A quick fact sheet of the stem cell therapy is a good way to familiarize yourself with the subject. Stem cells are broadly classified into Embryonic stem cells and Adult stem cells. 1. Embryonic stem cells are derived from the human embryos. They are totipotent in nature and have the highest potential to repair and regenerate any cells of the body. However their therapeutic potential is bogged due to the controversial belief of killing life in the form of an embryo raising moral and ethical concerns. Further it is also difficult to control the growth and differentiation of these cells posing a risk of tumor formation. 2. Adult stem cells are found mostly in all adult tissues. They have the excellent plasticity i.e. the potential to develop any cell irrespective of the origin of the parent cell from which it is derived. Due to their great homing capability, ability to integrate into host tissues, minimum ethical issues in their isolation make these cells promising candidates for the use of cells based therapies. As of now, Autologous Stem Cells is the most opted method by the medical practitioners. As there is no risk of immune rejection; the process is least expensive avoiding legal and ethical concerns. It is very simple yet effective requiring patient’s own stem cells, which are enriched outside the body in a certified laboratory and then injected back at the targeted site in the patient’s body. The Advancells treatment is the outcome of therapy experiences of scores of patients, treated in collaboration with many international forward-looking universities and advanced medical clinics. Presently, the post-treatment results of several degenerative diseases are very encouraging, especially when classical treatment has failed to provide a solution. Almost in every century there is a great advancement in the field of medicine. Discovery of vaccines flashed two hundred years ago. One hundred year ago, penicillin created a huge shift in the medical field. Today the discovery of body’s own creator “The Stem Cells” represents an equally incredible discovery; opening up a whole new vision for treating diseases. 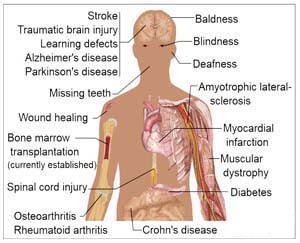 We all have inbuilt facility for banking up stem cells in our bone marrow, fat and other areas. These cells are exploited as and when needed for the process of healing. But this reserve of our stem cells diminishes with the age. When we do not have enough quotas to address day to day insults to the body, symptoms occur leading to many devastating diseases. Intensive examination has become supremely important in order to find out an effective solution for debilitating diseases with unsatisfactory cure from conventional treatments. The process of extracting stem cells from bone marrow and fat and reintroducing them in adequate numbers back into the body to gear up the healing process of the body represents a new avenue for infamously incurable diseases like Alzheimer’s disease, Parkinson’s disease, Multiple Sclerosis and Spinal Cord Injury. The well-defined target of the therapy is either replacement of damaged cells with adult stem cells or to help the damaged cells in regeneration. Though the concept has generated lot of controversy in the past, today it is widely accepted medical treatment due to its range of application. Burgeoning evidence strongly emphasize on the positive effects of this therapeutical strategy in the field of degenerative disorders. We at Advancells have witnessed the tremendous potential while curing patients almost every day. By experiencing the positive results of the stem cell therapy and understanding what these outcomes mean to our dejected patient drives us passionate to deliver to the best of our abilities.